A spectacular floral design of a yellow and orange toned Dahlia in full bloom is the central subject in this chart, but the gorgeous purple and black butterfly is the focal point. Barbara Baatz-Hillman’s florals are always dramatic. 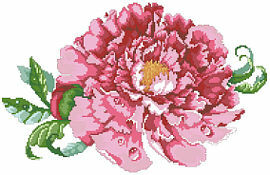 A companion piece, Luscious Tree Peony, would make a perfect companion to the Classic Dahlia. Contents: Stitch Count 192w x 123h. Finished size on 14ct 14" x 9"